Hungryroot Review: The Most Unique & Fun Vegan Meal Delivery Service? 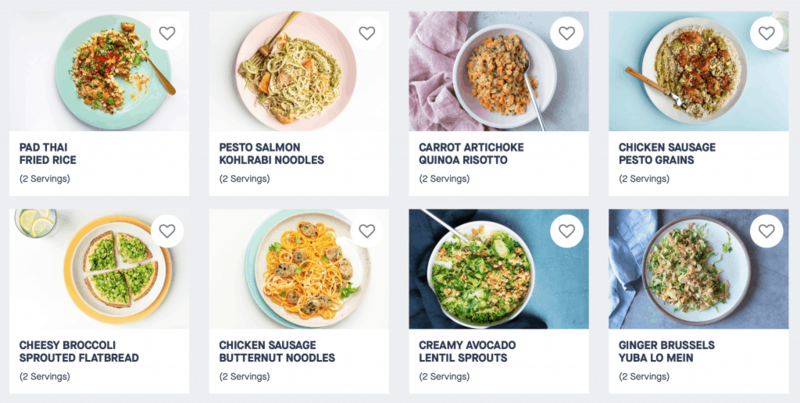 *March 4, 2019 Update: Hungryroot has updated their meal delivery service to now include more than just vegan options, now with animal products. However, you can still order their vegan plan. You’ll find options such as: gluten-free, nut-free, soy-free, vegan, vegetarian, and more. There’s a common misconception that eating healthy is difficult and time-consuming. People think that the only way they can get fast and easy meals is to hit up the drive-thru, grab a greasy burger, and give into those unhealthy temptations. However, that isn’t true anymore! 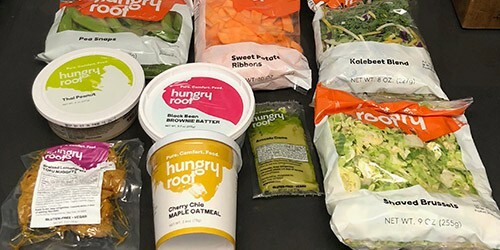 In fact, meal delivery services like Hungryroot are making it so much easier to eat healthy without the hassle of trying to figure out what to cook, ingredients needed, etc. Hungryroot started back in 2014 with a simple ideas — healthy, plant-based meals should be easy and appealing. They wanted to rebrand vegan eating from dull to delicious. 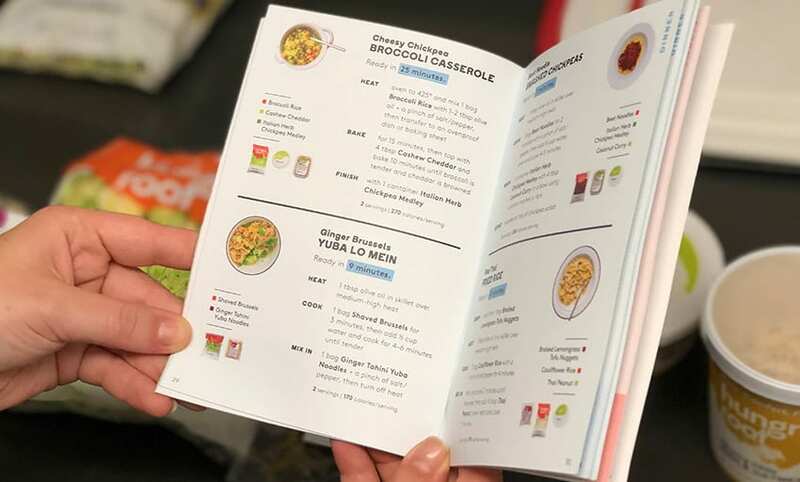 In 2019 they updated their meal kit to include animal proteins. Today Hungryroot serves thousands of customers their meals. What makes them unique, among the plenthora of other meal delivery services is the fact that their meals are either pre-made or very simple to prep and cook. They’re also high in nutrients, fiber, and the good fats. Plus, everything is low in sugar, sodium, and calories. If you’re wondering what you can expect when you join Hungryroot, you’re in luck! We’re giving you a first-hand look at what you can expect. To get started, you’ll first need to choose which plan is going to best suit your needs. Currently, there are two options that include The Starter Set and The Good Life. The Starter Set provides you with four meals (two servings a piece), as well as two sides, snacks, or sweets. With The Good Life, you’ll receive five meals (two servings a piece), and five sides, snacks, or sweets. Which one you choose really depends how much food you’d like from Hungryroot. Orders are delivered on a weekly basis and there’s always a rotating menu for you to select meals from. You’ll be able to choose from their best sellers or create your own box filled with your favorites. One of the things that’s unique about Hungryroot, when compared to other meal kits, is that you don’t only receive meals for dinner. You can also order breakfast and dessert options, which is something that many meal delivery services in general don’t provide. We found this to be a huge plus, since it makes meal planning for the entire day a lot easier (rather than just dinner). And there are also side and snack options too. Hungryroot ships orders to all of the 48 contiguous United States. That does, unfortunately, mean they’re unable to ship orders to Alaska and Hawaii. At this time, it doesn’t appear that they intend to expand their delivery area, but you can always check back for future changes. With a subscription, you’ll receive new orders each week, unless you choose to skip a week. You can expect the order to be delivered by 9 PM on your chosen delivery date. If you need to change your deliver date before an order ships out, you can do so via your online account. This gives you full control over when your food arrives each week. However, you don’t have to be home in order to receive your delivery. A signature isn’t required and everything is shipped in insulated boxes that will keep everything cool. All orders that ship via ground will ship for free. If you select air shipping during checkout, there will be a $10 fee. You’ll want to keep this in mind when placing your order. We had zero issues with delivery. 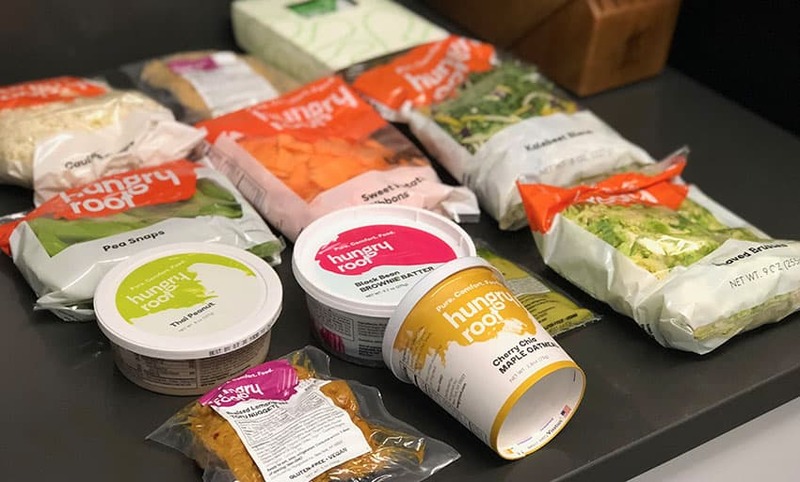 To keep your food cold and fresh during transit, Hungryroot uses 100% recycled and biodegradable cold get packs a well as insulated liners (also recycled and recyclable) in all of their boxes. Not only does this mean you won’t have to worry about anything spoiling before it arrives at your door, the liner acts as a protective barrier to keep food from getting damaged during transit. Everything is packed so that it will stay cold for at least few hours after being delivered to you, meaning it’ll be waiting for you at home, safe and sound. Upon opening our first box, all the contents inside were still nice and cool. Just remember to refrigerate everything as soon as you can — don’t leave it in the box. You can also recycle the packaging when you’re done with it. The shipping boxes are made from 100% recycled paper, so they can be recycled once you’ve unpacked your box. Simply put this with your regular paper recycling. The ice packs inside your order can actually be re-used, which we highly recommend doing. Not only because they’re high quality ice packs but because it’s the best way to recycle them. However, they’re filled with a non-toxic gel, which means you can safely dispose of them. 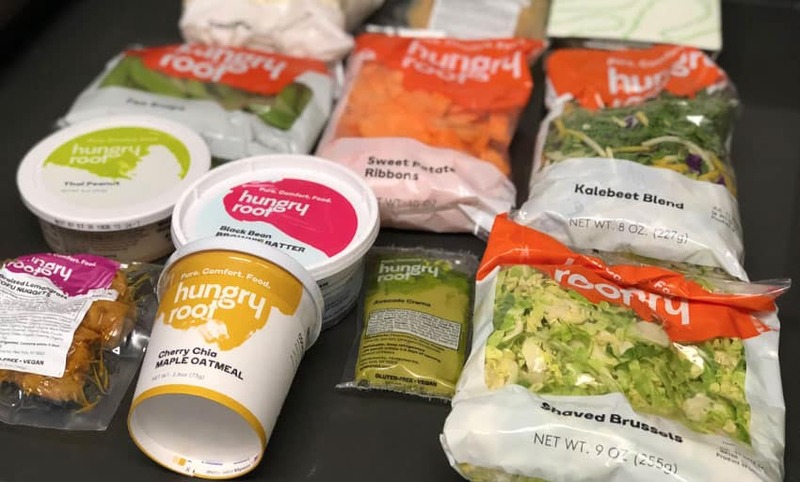 Hungryroot says on their website all you have to do is cut open the ice pack, pour the gel into the trash, and recycle the exterior liner with your plastic. And finally, the thermal liners Hungryroot uses are made of 100% recyclable ply film and post-industrial/pre-consumer 100% recycled cotton. To get rid of these, you need to cut the top of the plastic film and remove the cotton. You can throw the cotton out where it will biodegrade or compost, if this is available to you. The entire liner is actually biodegradable, so you can put that with your regular trash. And the plastic film that surrounds the thermal liner is made of #4 plastic and can be recycled as such. For a plant-based meal delivery company, it’s nice to see that Hungryroot really cares about the recyclability of their packaging. 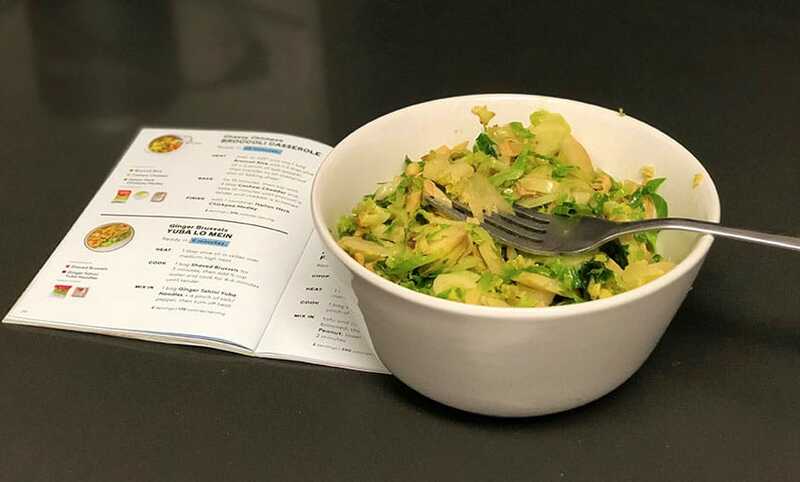 While many meal delivery services provide you with fresh ingredients and a recipe to follow along with, that’s not really what you get with Hungryroot. Their mission is to make healthy eating incredibly easy, so everything comes already (or mostly) prepared. That means you just have to follow the cooking instructions to whip everything up so it’ll be ready to enjoy. Now, just because they’re already prepared meals that doesn’t mean they aren’t going to be fresh. In fact, quite the contrary. We found all of our meals to be fresh — even the pre-made ones. On the packaging they all have a “best by” date, so you know when to eat them by. They source organic and non-GMO ingredients whenever possible. And you can find a full ingredient list and nutritional information on their site before ordering. So there’s no need to worry about any allergies. Many of the meals that Hungryroot offers don’t require any preparation at all. For instance, the Braised Lemongrass Tofu Nuggets we received can simply be heated up and eaten. In fact, they don’t even need to be heated, they could even be eaten cold. Plus, their desserts are ready to enjoy, meaning you can reach for them whenever a sweet tooth craving strikes :). When it comes to the meals that need to be cooked, Hungryroot feels they are best prepared on the stovetop. However, some of them can also be heated in the microwave if you’d like. Just make sure you’re paying attention to the cooking instructions and following along. Most recipes only require a few simple steps and one pan. We were able to cook our meals in as little as 10 to 15 minutes. A favorite dish of ours, and the one we reviewed in the video, is definitely the Ginger Brussels Yuba Lo Mein. It’s loaded with protein (16 grams) and vitamin C (120% of your daily value). Getting enough nutrients, specifically protein, is very important when following a vegan diet. This is because vegans, unfortunately, have a much higher risk of being protein deficient. 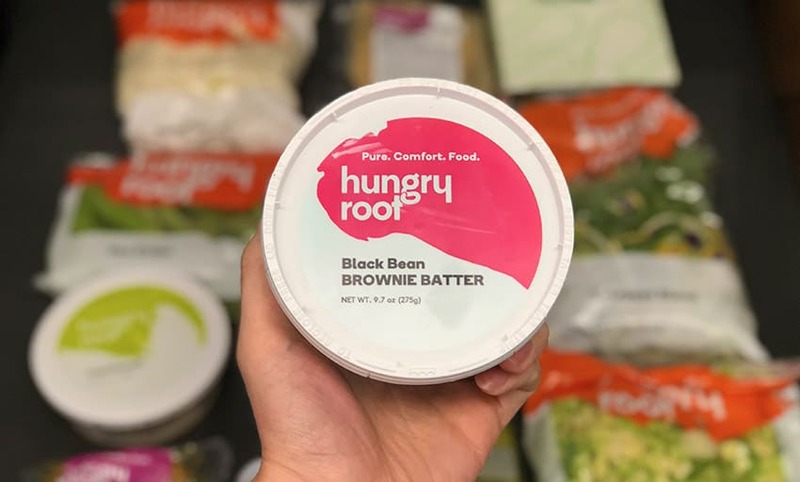 While we enjoyed all of the meals Hungryroot sent us, there was one that really stood out… The Black Bean Brownie Batter. It was incredible. 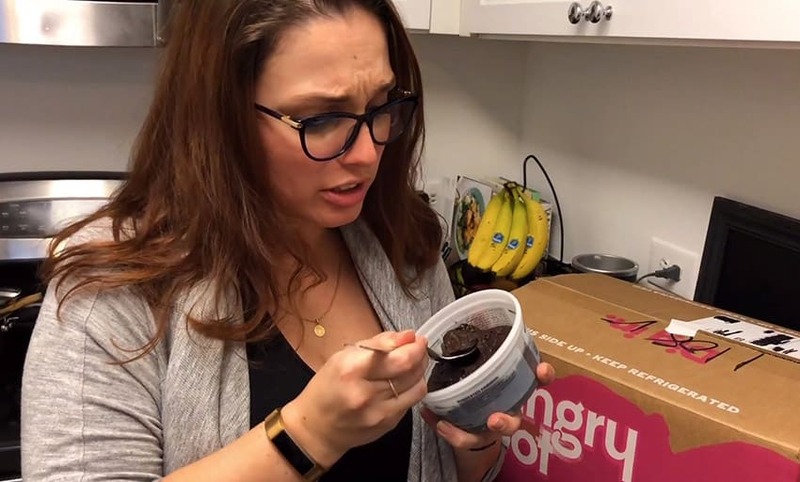 One taste and you’re going to think you’re actually eating Brownie Batter but then you read the ingredients and realize it’s made from mostly black beans. It’s a delicious mind trick! Very unique and fun meals. Out of all of the meal kits we’ve reviewed, Hungryroot definitely has some of the most unique food options (in a good way). For example, their snickerdoodle dough and brownie batter are both made from beans, making them 100% vegan and 100% delicious. One of the few meal kits with vegan plan. Hungryroot started as a vegan meal kit. However, now that they include all types of diets, they do still have a vegan option. In addition to breakfast, lunch, and dinner, they also offer sides and snacks. This is not something all meal kits offer. Very easy to cook. Many of the foods they send are either pre-cooked or need very little preparation prior to eating. The meals are unique. Yes, this is listed as a “pro” above but for some people this might actually be a con. You’re not going to get a burger recipe or steak filet with this meal kit. Portion sizes are a little small. Some people might find that the meals are not enough to fill them up. Some meals may need a little “extra”. After cooking, we found some dishes needed a little extra seasoning to bring out the flavor. Not a huge deal though — just have salt, pepper, etc. on hand. They don’t tell you the exact amount of food you’re getting. This one is pretty odd… When you sign up for a plan, they only tell you an approximation of how many meals you’ll get. How much you pay with Hungryroot depends on which plan you decide to go with. The “Small” is their cheapest option, which comes in at $59 for your first box ($69 per week after). The “Medium” comes in at $79 for your first box ($99 per week after). And the “Large” comes in at $99 for your first box ($129 per week after). Hungryroot definitely surprised us. Why? Vegan meals have a bad reputation for being boring, tasteless, and consuming mostly of tofu. Hungryroot has completely changed the vegan game. Their meals are actually fun to eat, which is something that I’ve never said about a vegan meal kit before. When it comes to eating healthy and plant-based, it doesn’t have to be time consuming. If you’re someone who is tired of stressing over your weekly meal plan and you want something vegan, vegetarian, gluten-free, quick, easy, and filling to enjoy, Hungryroot is a great meal delivery service to consider. Also, remember that they updated their service in 2019 to include lean proteins. So even if you don’t follow a vegan diet, you can still enjoy their meal kit! Have a question about Hungryroot we didn’t answer? 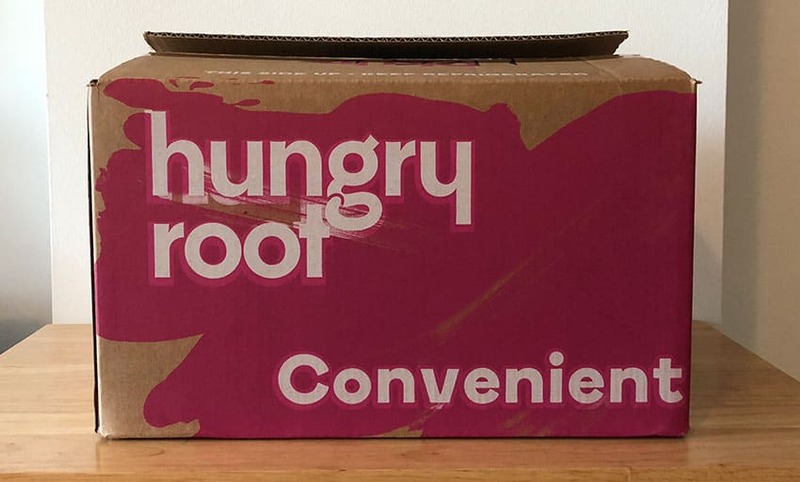 Have you tried Hungryroot before? Leave a comment below! Be aware that Hungry Root is now more than just vegan options. They also have “lean proteins”. I was recommended this meal kit by a friend and fellow vegan last year and just recently went to sign up. I am not bad mouthing them because I understand why they had to make the choice to switch. To other vegans out there just be careful what you order!